Adding water to the water of life is a perilous business: how do you know when to dilute your whisky, and by how much? Ian Wisniewski asks the experts – and conducts a little research of his own. 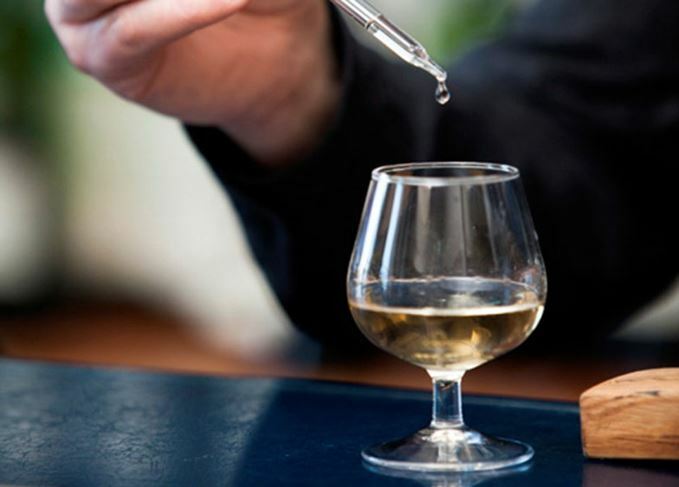 Easy does it: a little water can radically alter the whisky in your glass. Photo courtesy of Uisge Source. ‘Would you like water with your whisky? It may seem a polite enquiry, but it’s actually a vital question as so much depends on the answer. Adding water is often assumed to be the right thing to do, as a frequently repeated line states that adding water ‘opens up’ a whisky. This suggests water plays an entirely bountiful role, enabling you to experience more from the whisky. In which case, who wouldn’t follow such advice? However, adding water also changes the character of a whisky. Consequently, what matters is whether you consider that change to be an improvement. I’d like to make my position clear (transparency being essential). I’m not a diluter, generally. But I’m not a dictator either, and I have preferred some malts with a little water, and this is certainly the preference of master blenders when assessing samples. ‘For established expressions I work with samples at 20% abv, checking to make sure everything is correct,’ says Sandy Hyslop, master blender at Ballantine’s. The simple act of adding water to whisky instigates various complex reactions, not all of which are fully understood. Whisky comprises alcohol molecules, water molecules and various flavour compounds, which arrange themselves in a particular aggregation or ‘pattern’. However, when water is added and the alcoholic strength changes, so does this aggregation, which in turn alters the flavour profile. But exactly why and how this process operates is still not fully understood. ‘Alcohol can “drown out” certain flavours in a whisky, and prevent them from being discerned, but adding water – and so lowering the alcoholic strength – makes more flavours more visible,’ says Gordon Motion, Edrington’s master blender. Adding water may make a whisky seem more open, but also less intense; which could be considered an improvement – or a cause for regret – depending on your preference. Another observation is that whisky at bottling strength often shows a sequence of individual characteristics, each having its moment in the spotlight, whereas adding water can make these notes seem more ‘integrated’, appearing simultaneously within a group, though still individually discernible. Moreover, according to Stuart Harvey, master blender at Inver House Distillers, ‘the effect of adding water can vary depending on the type of cask used for aging. ‘With Spanish oak you must be very careful how much water you add, as adding more water can unbalance the Spanish oak notes. American oak matured whiskies generally take more water better’. Adding water can also have a significant effect on peated malts. ‘A higher alcoholic strength can subdue smokiness, and adding some water really releases the smoky character,’ says Stuart Urquhart, whisky supply manager at Gordon & MacPhail. On a practical note, the effect of adding water also depends on the bottling strength, which varies enormously (particularly among malts). Adding the same amount of water to whisky bottled at 40% abv won’t, of course, have the same effect as adding it to whisky at, for example, 46% abv. Similarly, adding the same amount of water to a smaller measure won’t have the same effect as adding it to a larger one. The water, ideally bottled, should be such that it doesn’t add any flavour of its own, otherwise you may taste characteristics for which the master blender isn’t responsible. But any guidelines are, inevitably, just that, and each whisky should be assessed separately. One option is to line up four identical glasses, each containing the same amount of a particular whisky. This can be left neat in the first glass, adding a drop or so of water to the second glass, two drops to the third glass, and three drops to the fourth. ‘I’d start tasting at the lowest strength, and go up the scale, then have a break, and go back down the scale. You can pick up things a little differently each way,’ says Hyslop. This is a very thorough approach, but then that’s the only way to know whether, and how much, water suits your palate with a particular whisky. It’s something we all need to know, rather than taking any chances. Elegant, fresh, lightly luscious, zesty lemon, grapefruit, hint of creaminess, with light sweetness emerging, together with hints of underlying oak and dryness. Mellower, more integrated citrus notes, slightly more oak and sweetness, followed by greater dryness. Top notes replaced by deeper notes, dryness and lightly luscious sweetness increase, with more oak and vanilla following. Integrated mellowness, equally balanced citrus, dark chocolate, oak and underlying dryness. Smokiness and sweetness emerge, with barbecue notes, then vanilla, lemon, hints of sea salt, dryness and oak. Mellow and more integrated, sweetness leads with vanilla, lemon and light creaminess, then lighter barbecue notes come through, with dry oak. Mellower, integrated notes, light lemon and vanilla lead, barbecue notes follow, with dry oak and hints of sweetness at the edges, together with lemon zest and maltiness. Even mellower and more integrated, sweetness balanced by dryness with light vanilla and barbecue notes, followed by toasty hints and lemon zest. The maker of Chivas Regal and Ballantine’s says blends – and malts – are often misunderstood.